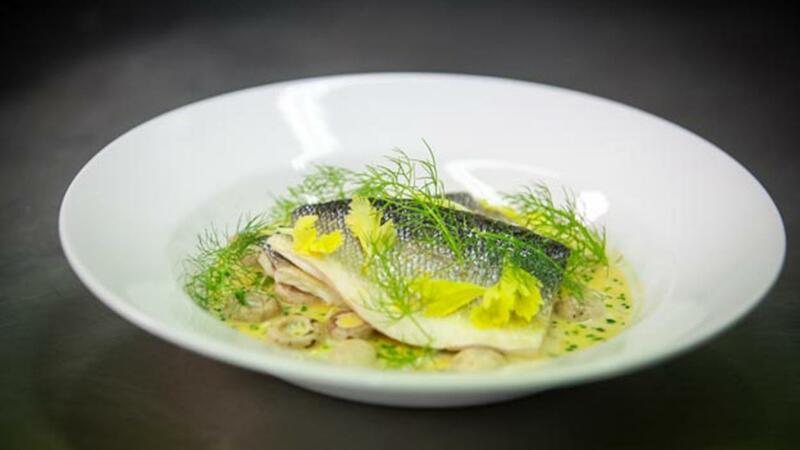 Create a light and delicious starter for your guests with our sea bass filet recipe. The citrus and chive sauce with double cream gives the pan fried fish a tangy taste. Ideal for a summer menu. Add the oil to a non-stick pan and heat. Pan fry the Sea Bass skin side down first and then turn the fish when the skin is golden finish it cooking with a small amount of butter. Remove the fish from the pan, reserve. Add the butter to the pan you have just cooked the fish in and then sauté the shallots until they are soft. Add the white wine and reduce by 1/2, once the wine is reduced, add the cream and allow the sauce to simmer until desired consistency is reached. Add the chopped chives and lemon juice to the sauce and season to taste. Place a small ball of rocket in the center of the plate, lay the fish over it and then spoon the sauce around the plate, serve immediately.